The RNC has reported receipts of close to $25.3 million. 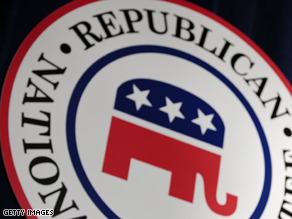 (CNN) - The Republican National Committee announced Friday it will report receipts of $25.3 million in the first three months of 2009, the committee's first fundraising quarter under the chairmanship of Michael Steele. The RNC also reported a significant fundraising increase during the month of March, when it took in $6.7 million. That compares to a $5.8 million haul in January and the $5.1 million the committee raised in February. The GOP also received close to $7 million in a transfer of leftover funds from the McCain-Palin Victory Committee. The $25.3 million in receipts is well short of the $36 million the RNC raised in the same period in 2008, during the height of the presidential primaries. In all, the RNC currently has $23.6 million cash-on-hand, compared to $31 million one year ago. The Democratic National Committee has yet to reveal its fundraising numbers for the first quarter.